My first Lindyfest was two years ago where I served as the Balboa DJ for competitions, a special Bal dance, and I even DJ’ed some for Lindy Hop. 😉 This long-running workshop weekend is a huge event in Houston, Texas and I’m delighted that they have invited me back to be the Balboa DJ again and sing two nights with the Jonathan Doyle Swingtet! This will be my first time performing with his group, after I first performed with Jonathan at the Nevermore Jazz Ball in St. Louis this past November as part of Michael Gamble and the Rhythm Serenaders, and I’m excited to be working with an amazing group of Austin musicians lead by this powerhouse reed man. World class instruction, the Lone Star Championships, great live and DJ’ed music, and I see that Sugar Sullivan will be joining us! Come to Texas and dance! I am pleased as punch to be taking my first trip to St. Louis, MO and the excitement is twofold – I have several old, dear friends who have moved there that I am excited to visit and I will be performing at the Nevermore Jazz Ball for two nights with Michael Gamble and the Rhythm Serenaders! I hope to also take in some sights (re: vintage shopping) and look forward to listening to some great St. Louis bands at the event’s Cherokee Street Jazz Crawl – like a bar crawl (actually a bar crawl?) for Lindy Hoppers with different dance bands at each bar/venue. 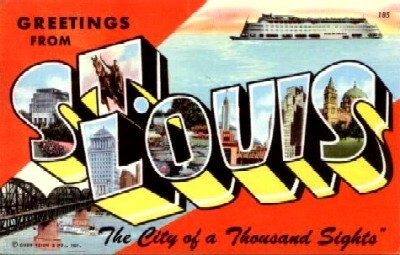 See you soon, St. Louis!